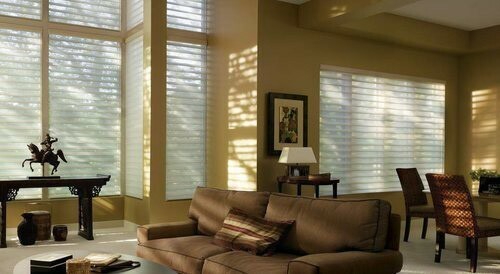 Add elegance and function to any room in the house with the soft louvering system of Silhouette®. Control light and privacy by rotating the fabric louvers of this product or open the louvers for a soft diffuse sheer effect. When you want the window to allow the full view out and all of the light in simply raise the Silhouette® into the sleek contoured headrail. 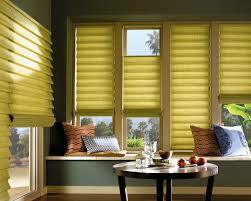 Pirouette® provides a bold and modern alternative to the look and feel of traditional fabric shades. Pirouette shadings feature softly contoured fabric vanes that magically open and close to give you complete control over your desired degree of light filtration and privacy. The revolutionary Invisi-Lift™ system allows the vanes to float gracefully on a single sheer backing. 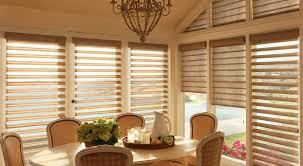 Imagine a Roman shade that has uniform, contoured or flat-fabric folds, and no exposed rear cords. We’ve taken out all the issues from the standard Roman and made it into a flawless modern shade. Unlike other Roman shades, Vignette shades can open from the top, from the bottom or somewhere in-between for the perfect balance of privacy and light.